Facebook Chat plugin for Pidgin allows you to chat with your Facebook buddies inse Pidgin. It connects to the new Facebook Chat IM service without the need for an API key. 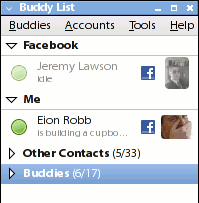 Currently the plugin can log into the Facebook servers, grab the buddy list, and send/receive messages.